I love Greg Bear's books. They're thought-provoking, complex, and always on the cutting edge of science. 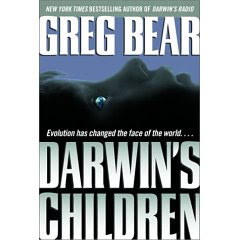 Darwin's Children, Bear's sequel to Darwin's Radio, is no exception. Darwin's Radio, the winner of the 2000 Nebula Award, tells the story of a new form of endogenous retrovirus called SHEVA. It controls human evolution by rapidly evolving the next generation while in the womb, leading to speciation. Darwin's Children is the story of how our society handles these "new children," and the impact they have on our society. Well. As you'd expect, society does not simply say, "Oh, Goody - the next wave of humans, here to displace us! Let's celebrate!" Aside from being highly unlikely, it wouldn't make a very interesting book. This is a classic story of Government Behaving Badly. The "virus children" are taken away from their parents, and placed in what is essentially an internment camp. They're poked and prodded, and their natural, instinctive social structure (which, as you can imagine, is not the same as ours) is blocked and the children are punished if they try and interact naturally. I have to say that I did find this sequel to be inferior to Darwin's Radio. There were strange asides, including a scenario where one of the main characters experiences what can only be called visitations from God. The story didn't seem as tight, and I had a hard time "connecting" with the New Children emotionally, aside from the natural empathy I had for a minority group being persecuted. My lack of an emotional connection to the New Children might have been done purposefully, since their alien nature was part of the story. In my opinion, no modern science fiction author does a better job on the science than Greg Bear. Many of the scientific concepts in this book are extremely controversial, and Mr. Bear freely admits that. But that's why it's science fiction. He's taking cutting edge science and running with it - all the way to the end zone. Eeek. I think I might have some toruble suspending disbelief for this one. But I'll check it out. John, with your background, I would expect you would have to do a lot of suspending disbelief if you wanted to read SF. This is an advantage of being a scientific neophyte. I can say "coooool!" when I read SF, then wipe the drool off my chin. I don't read much military fiction, though, because I can't suspend disbelief. Well, I'll run my military fiction past ya before I submit it, when I get some out. It just seems to me that many SF writers of the 60s had a better grasp of science, today's writers take more flights of fancy. Numberwatch, a site dedicated to debunking lying statistics, has a whole page up about how Crighton's grey goo is impossible. I did a fair amount of rheology in grad school, and had come to the same conclusion - if a nanobot is a real nanobot, meaning it is a machine that is at most 100s of nanometers wide, how can it store enough energy in a size that small to propel itself across macroscopic distances in a matter of days, let alone seconds? This bothers me about the "nanotech" bandaid many SF authors use these days. Scalzi is not immune - those "nanobot" parachutes. First, they'd have to move at incredible speeds in order to form up in time, and second, they'd have to use tremendous energy forming chemical bonds to each other in order to keep air resistance from ripping the parachute back into floating nanobots. I have no background in molecular biology (except for one molecular biology class at UHM), so Bear's explanations and research sound plausible to me. He also includes appendixes in his books about what controversies exist on the science he chooses to include in his book, and why he chooses to write about them anyway. The problem with new speciation is the immune system. Mothers share IGs with the fetus, which is why most newborns with an as-yet un-imprinted immune systems don't die of infections at incredible rates. A novel species in a womb would have an anaphylactic raction ot the mother's IG entering the placenta, or it would enter hte world with extremely low immune defenses. And that's just the first argument that rolls out of my head. But I will give it a read in the future and see how he tries to get around the problems. I remember that he did address that issue in Darwin's Radio, although I don't remember all the details...I read it a number of years ago. I'd be interested in your thoughts when/if you get a chance to read it.